Peanut allergies are very similar to other allergies, which are abnormal responses by the body’s immune system to otherwise harmless substances. In a peanut allergic child, when the immune system detects peanut protein, antibodies are produced that trigger an inappropriate immune response. Over the past several decades, faced with the growing problem of peanut allergy, health authorities in the UK, Canada, and US recommended that children at high risk for peanut allergy should not eat any peanut-containing foods under the age of three. More recently however, scientists have begun calling this strategy into question. Many scientists now believe that by repeatedly exposing the child's immune system to peanut at an early age, their body learns to tolerate the peanut proteins. Evidence for this theory comes from several other countries whose children typically consume high levels of peanut protein from infancy onwards, yet fail to show the high rates of peanut allergy observed in Western countries where peanut is generally avoided in early life. There is currently no cure for peanut allergy. Children who are allergic to peanuts must take great care to be vigilant in avoiding all traces of peanut from their diet. In addition, peanut allergic children often need to wear a Medic-Alert bracelet and, at all times, carry a pre-loaded adrenaline (epinephrine) injection kit with them for use in event of a severe reaction. What happens during an allergic reaction to peanut? The allergic reaction to peanut occurs soon after exposure (usually through ingestion). Typical immediate allergic reactions include the development of hives on the face or body; blotching around the mouth (which may spread to the rest of the body); immediate runny nose, sneezing and itchy-watery eyes; coughing; choking or gagging; wheezing and trouble breathing; and cramps, vomiting and diarrhea. Although allergic reactions are usually mild to moderate in severity and usually terminate spontaneously or after the administration of an antihistamine, severe reactions - known as anaphylaxis – can occur. Anaphylaxis is a severe allergic reaction which involves several parts of the body and can be fatal if not treated immediately. 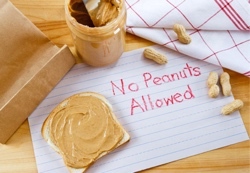 Why is peanut allergy a problem? The prevalence of peanut allergy has doubled over the past 10 years in countries that advocate avoidance of peanuts during pregnancy, lactation and infancy. Peanut allergy now affects approximately 1.5% of young children and is often diagnosed in children less than 2 years old. While there are many types of food allergies, peanut allergies are particularly troublesome, for a number of reasons. Foremost is the fact that peanut allergy often results in more severe reactions than other food allergies, up to and including sudden death. In addition, other than the complete avoidance of peanut, there is currently no available therapy for the treatment of peanut allergy. Importantly, symptoms can occur following exposure to only very tiny (or 'trace') amounts of peanut protein. Because peanuts are used in a wide variety of food products, trace amounts of peanut protein can be found in many foods - from chocolate bars to fruit snacks, making avoidance difficult.